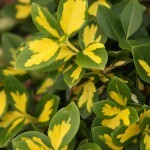 Compact, low shrub has wavy, glossy, dark green foliage with bright yellow centers. The contrast between dark green and yellow is more pronounced than on 'Emerald 'N Gold'. 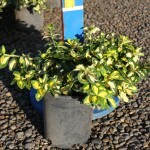 Useful as a low hedge, mass planting, or ground cover. It is not particular about sun or shade and will tolerate all but extremely wet soils.